Last month a rep from the Netherlands plus-size retailer Yoek contacted me about their new upcoming Black Label. Yoek is a quality brand for all fashion loving women with a plus size. Yoek creates fashionable clothing with a beautiful and feminine flair. Yoek has a clear idea what fashion in size 38 – 58 should be: Clothes which do not hide the figure, but make every woman look wonderful. While researching their website I came across this skirt with letters (€89.00) that caught my attention. Although it is not from their Black Label I chose it because it took me back to the days of Sesame Street and learning my ABC’s. The skirt is a stretchy pencil style with a overlap at the waist area. The sizing options go from a size S (12/14) -Plus(28-30). So this week my skirt arrived to me and I couldn’t be more impressed with the neatness of the packaging and pretty bow on top for me. Since I seem to be wearing a lot of black & white in my daily routine here lately instead of just throwing plain ole red with it I opted for some blue as well. I wore these hot new Torrid Cobalt Blue Lace-Up Booties ($54.50, Sizes 7-13), a red long-sleeved Michael Kors shirt (Macy’s) and my fave black Simply Be blazer. 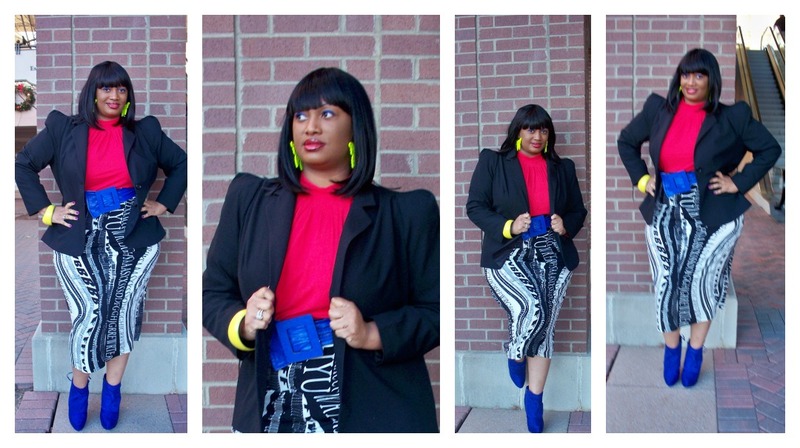 To compliment the booties I added a blue wide belt from Dots then completed my look with an added splash of color by wearing a yellow bracelet and earrings to match that. P.S.- I’m rocking my new Vivica Fox chinese cut wig named Tamara. I’ve been searching for years for the perfect bob-cut wig and have finally found it, HALLELUJAH!!! I was out today doing a little after Thanksgiving Day shopping and while in Macy’s I came across this new fragrance by Lady GaGa called Fame. Every holiday season I treat myself to a new fragrance and although the Rihanna and Nicki Minaj perfumes also smelled delicious I decided on the Fame today. 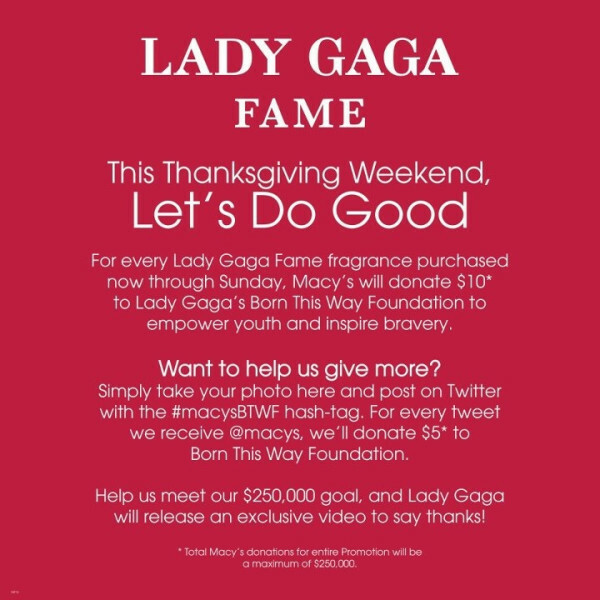 The fact that for this weekend only for every purchase made, Macy’s is donating $10 to her ‘Born This Way Foundation’ to empower youth and inspire bravery sold me. During the holidays is the best time to get fragrances because they come in sets and also with free gifts many times. I prefer layering my fragrance with shower gels, lotions, etc. then the actual perfume. 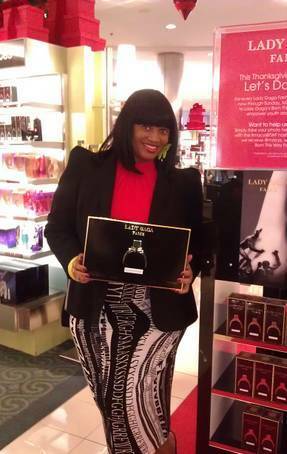 So I purchased this Lady GaGa Fame Gift Set ($84.00) which is a Macy’s exclusive.